Hybrid fuel economy from a non-hybrid car? 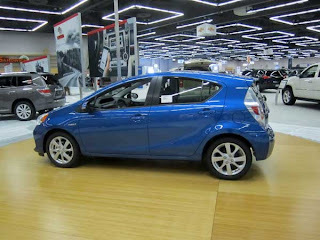 At the time of this writing, I’ve got a 2012 Toyota Prius c for review. I’ve put about 220 miles on it and I’m averaging 46 MPG combined. Not bad. The Prius c zigs and zags around the city quite well. However, on the open road, especially in hills or when passing, it’s pretty pokey. But that’s fine; it’s not built to be a high-powered Interstate cruiser, and I get that. Let’s look at the 2012 Yaris. It also has a 1.5-liter engine, but makes 106 hp and 103 ft./lbs. of torque. It also weighs some 200 lbs. less than a Prius c and is equipped with a four-speed auto vs. the Prius’ CVT. So I have to wonder, what would a 74 horse engine be like in the 2,295 lb. Yaris, and what kind of fuel economy numbers would we see without the hybrid drivetrain? How good (or bad) would performance be? The current Yaris isn’t exactly a pig when it comes to fuel economy. It’s rated at 30 city, 38 highway (33 combined). But if you put in an efficient CVT (vs. the 4-speed auto) and cut power by 32 ponies, I’d bet the fuel economy would be pretty darn good. But I know what you’re likely thinking. It only has 74 hosepower. So what? There have been much less powerful cars offered throughout time. Were they fast? Nope. And frankly, a 1986 Chevrolet Sprint with 48 horsepower at 5,100 RPM probably didn’t instill a lot of confidence in many drivers when merging or passing. But guess what? It was EPA rated as high as 44 city and 53 highway way back in 1986. The Pruis c, with its hybrid drivetrain is rated 53 city and 46 highway today. Other parts of the world do get the modern equivalent of the Chevy Sprint and still have many of the safety features of modern cars. Toyota even offers the Yaris with a 1.3 liter mill in other countries. However, I’d bet most North Americans don’t want to take the cut in power. Is having only 75, 50, 48 horsepower even safe these days? Ask a Smart ForTwo owner; that vehicle only makes 70 hp. So are we as consumers simply obsessed with alleged engine output, or would sub-100 hp cars truly not sell if marketed correctly? Companies have seemed to be able to extract good power out of small-displacement engines. The 1.4-liter turbocharged engine in the Chevrolet Sonic and Cruze, are good examples, as is the upcoming 1.0-liter EcoBoost engine from Ford. But what about high fuel economy? I bet it can be done. In the meantime, I’ll enjoy the 46 MPGs I’m getting in my Prius c. But is there another way to get hybrid MPGs without having a hybrid? Look to the "Ecomodder" community. Weight, aero, and shutting the engine off when not needed are the answers. Take the lightweight and aerodynamic Prius shell, put in a 90 hp 1.3 liter with an autostart system (so it will shut itself off at a traffic light and seamlessly restart), and I'd expect at least 45 mpg. Put the 1.4 liter Yaris TDI in it and it would do 55-60 mpg easily. The US is a bit unique in having so many long, high speed highways and people who use them every day just to get to work. Still, my 70s Beetles had only 60hp and it never stopped me from going anywhere. I racked up hundreds of thousands of miles in those cars. I've been saying this for the past few years. We need small, simple, underpowered eco-cars. Hybrids are mighty expensive for the performance, or lack thereof, you get with the deal. It's entirely possible to get close to and higher numbers without the weight added from all the bulk that comes along with a hybrid system. I do think that cars like this would fail in the US, simply because it's all about numbers and who has bigger numbers. I would like to see someone try though. Remember that in 2008 the EPA changed the way they calculate fuel economy estimates. You cannot directly compare older vehicles with current ones simply by the numbers published at the time. At any rate, I would love to see a modern non-hybrid high-fuel-economy vehicle on the market. 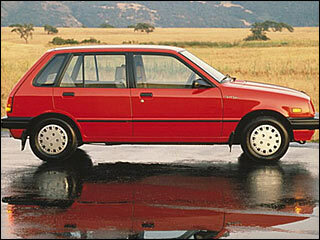 Honda's old HF models, as well as Geo Metros got stellar fuel economy. Certainly modern technology could go a long way towards compensating for all the weight that modern cars must lug around to meet government crash & emissions standards. It's disappointing to see the relatively poor fuel economy from cars such as the Smart and Spark, when run-of-the-mill midsize family sedans have little trouble hitting 40mpg. First car was a geo metro with a 1.0 liter 3 cylinder mated to a 5 speed manual gearbox. it got 43 mpg all day eben when driving like a 16 year old. later i invested in a 1994 geo metro xfl which was specifically designed for fuel economy. i stripped out the rear seat and rear carpets etc. that car got up to 57 mpg on the highway. Sure I looked like a doofus but for a commuter car in college it sure as hell did save me some cash at the pump. Now I drive a 1994 suzuki swift gt, same as a geo metro but instead with a 1.3l dohc 16v 4 cylinder motor with 4 wheel disc brakes, sway bars front and rear etc etc, and in that car driving like i don care about economy from time to time i still average 38mpg everyday driving. Hybrids sure are flashy for now but if we could achieve the same gas mileage as a 993cc carbureted motor back in 1985 for a fraction of the price, why not? why not bring back the micro car?